An opulent, luxurious spa basket is the perfect way to pamper anyone. 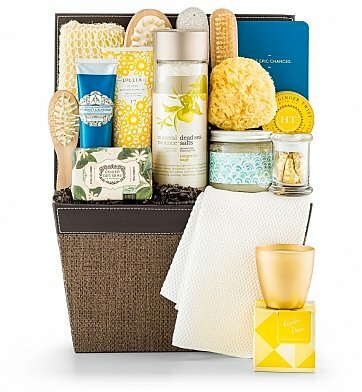 Soothing scrubs, fragrant soaps and lotions, spa tools and so much more overflow from this keepsake basket, creating an enduring gift that won't soon be forgotten. Panier Des Sens Soap, Natural Sea Sponge. Tangerine Sage Dead Sea Salt, Amber Dunes Illume Candle. Spearmint Rosemary Body Cream, Lollia At Last Shower Gel. Peach Ginger Twist Tea, Journal and much more. Each gourmet item is carefully arranged in a keepsake basket. A free card is included with your personal message or greeting, as well as complimentary scissors so your recipient can easily open their gift. Your gift will leave a lasting impression as they continue to enjoy this elegant keepsake serving tray with hand-stitched leather trim. Measures 14" x 10" x 10". Opulent Spa Basket is a hand delivered gift. These gifts are delivered by one of our local design centers located throughout the United States and Canada. Same day delivery is available for most gifts when ordered before the cutoff time. The cutoff time for Opulent Spa Basket is 2 PM in the recipient's time zone. Harney & Sons Peach Ginger Twist TeaThis black tea blend combines the irresistible flavors of fresh peaches with the 'zing' of ginger. Tin contains 5 satchets. Panier Des Sens Jasmine SoapRich in shea butter, with soothing and protective properties this extra-gentle jasmine soap is suitable for daily use. Spearmint and Rosemary Body CreamInspired by Antigua's architecture, landscape and fragrances, Aromas Artesanales de Antigua Aromatherapy Body Cream contains natural Shea Butter which intensely moisturizes the body. A little luxury you can have every day. Tangerine Sage Dead Sea Mineral SaltsCombined with the soothing relief of sage and world-renowned Dead Sea bath salt, this therapeutic blend delivers glowing, radiant skin, along with a renewed, vibrant state of being. Hand in Hand Sea Salt ScrubHand in Hand Sea Salt Scrub is a fresh and invigorating blend of natural sea salt and ten varieties of mint, including water mint, peppermint, and freshly cut eucalyptus. Lollia At Last Shower GelLuxe Lather. Soft, soapy suds. Fresh Botanical extracts condition& cleanse. Honey-rich emollients of Shea Butter & Jojoba Oil deliver skin essential nutrients to smooth & moisturize, leaving skin refreshed & hydrated. Natural Dead Sea SpongeThis natural sea sponge creates a luxurious lather and gently exfoliates to remove dead cells and impurities from the surface, leaving behind soft, fresh skin. Take Epic Chances JournalThis bright, bold journal features a textured hardcover with gold foil stamping and a clean, modern look - and an irresistible statement that you'll want to live by. Luxury bath and body essentials to pamper from head to toe. Arranged in an exclusive GiftTree signature gift basket. Includes complimentary card with your personal greeting or message. We ordered this beautiful basket for someone whose husband recently passed away. I was so thrilled to see that it was delivered the day after I ordered it. The recipient was so thankful and told us she cried when she saw how beautiful the gift basket was. Such and beautiful gift and the perfect alternative to a food basket, since her wonderful neighbors were supplying tons of food! It appears to be a nice gift.